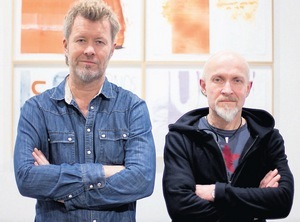 Magne’s latest exhibition Marginalia, for which he has collaborated with renowned Norwegian author Lars Saabye Christensen, opened on Thursday 4 February at Galleri Norske Grafikere in Oslo. 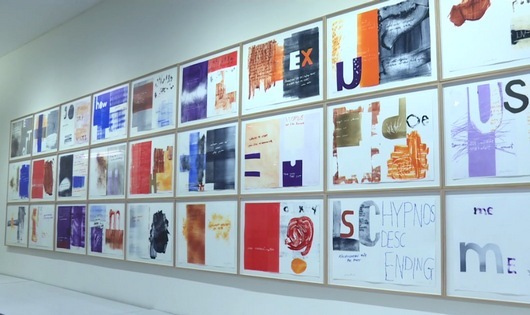 Marginalia consists of a selection of monotypes on paper they have worked on together, where Saabye Christensen has contributed sentences in Norwegian, plus Magne’s own larger monotypes on canvas, where he has used words in English. “We speak the same language. We wanted to do something together in the same room, combining Magne’s visual world and my own literary world”, Saabye Christensen says in an interview with NTB. The idea for the exhibition came about through what they call a “common grieving process”, after the film version of Saabye Christensen’s book Beatles didn’t end up as they had hoped. “Not all visions were realized”, Magne says dryly. This is not the first time the two of them have worked together. In addition to composing the score for Beatles in 2014, Magne composed the score for Ti Kniver i Hjertet (with Kjetil Bjerkestrand) in 1994, which was based on a book by Saabye Christensen. When Magne held his Foci exhibition in 2004, Saabye Christensen wrote the foreword in the exhibition catalogue. 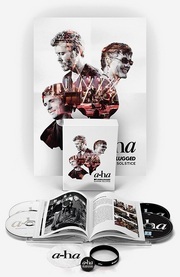 And in 1991 he collaborated with a-ha on the NRK TV special Østenfor sol og vestenfor måne. Marginalia is open until 28 February. In addition to being the new chairman for Bergen International Festival, Magne will also be performing at this year’s festival together with Apparatjik. The Day of the Dead is a colorful Mexican festival that eases the spiritual passing of those who have died. This festival is central when Apparatjik, in collaboration with Void and Mexican artists Laura Anderson Barbata and Concha Buika, present a staged concert production to honor Julia Pastrana both as an individual and an artist. “The story of Julia Pastrana is one of the most fascinating stories I have ever come across, both as an artist and as a fellow human being”, Magne said back in 2013, when he announced plans of an opera based on the Julia Pastrana story. The Apparatjik performance will be held at Grieghallen on 3 June 2016. Tickets are available now from billettservice.no. 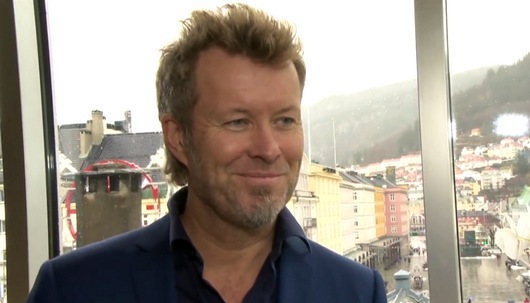 Magne Furuholmen has been appointed new chairman for Festspillene i Bergen (Bergen International Festival), for the period 2016 – 2019. This was announced at a press conference in Bergen today, where Magne was present alongside the festival’s artistic director Anders Beyer. For two weeks in May and June each year, Bergen International Festival presents a variety of performances within music, theatre, dance, opera and visual art. Being the chairman is a prestigious position, which will take up much of Magne’s time in the coming years. Bergen International Festival is a central power source in Norwegian art and culture, and I am pleased that one of Norway’s foremost and versatile artists has accepted the important position of chairman. With his international network and wide experience, Magne Furuholmen will strengthen the Festival in the years to come. The position as chairman for Bergen International Festival is a great honour and a prestigious national responsibility. The high level of artistic quality maintained throughout the years is very impressive. My role as chairman will be to facilitate further development of the festival’s international orientation, and build on the good work by the administration and former chairman. Bergen International Festival 2016 is held from 25 May to 8 June.